Stryker engineers say this 3-D printed lumbar cage is lighter and better imitates the porous nature of bone, encouraging spinal fusion. Neurosurgeons have longed for a lumbar cage that is light enough to limit the load on a patient's spine but also fuses well with surrounding lumbar vertebrae. Conventional lumbar cages are made of titanium or polyether ether ketone, known as PEEK, which can put a heavy load on the spine. Although some implants have porous material added to their surfaces to help with fusion, bone doesn't grow through PEEK or solid titanium. Rather than look for a new material, engineers at Stryker Corp. decided to fundamentally change how the device is manufactured. The Kalamazoo, Mich.-based devicemaker concluded that 3-D-printing could yield a significantly more porous titanium lumbar cage. The product could be lighter and better imitate the porous nature of bone, encouraging spinal fusion. Physicians have increasingly looked to 3-D printing for unique implants and surgical models, and some manufacturers are now using the method to mass produce medical devices and even drugs that are more precise, customizable and biocompatible than conventionally produced products. 3-D printing generally refers to the process of depositing material, one layer at a time, based on instructions from a digital file. Though physicians and biomedical engineers have been tinkering with the technology in growing numbers over the past decade, 3-D printers and the science of additive manufacturing have also become sophisticated enough that drugmakers and devicemakers have started to take notice. Although the technology can be expensive for complex manufacturing, proponents in the healthcare industry insist that costs will come down over time, and that the benefits in many cases already justify those costs. In many cases, 3-D printing provides physicians with a remarkably cheap way to fashion a device that fits or models the precise size and shape of a particular patient's anatomy. 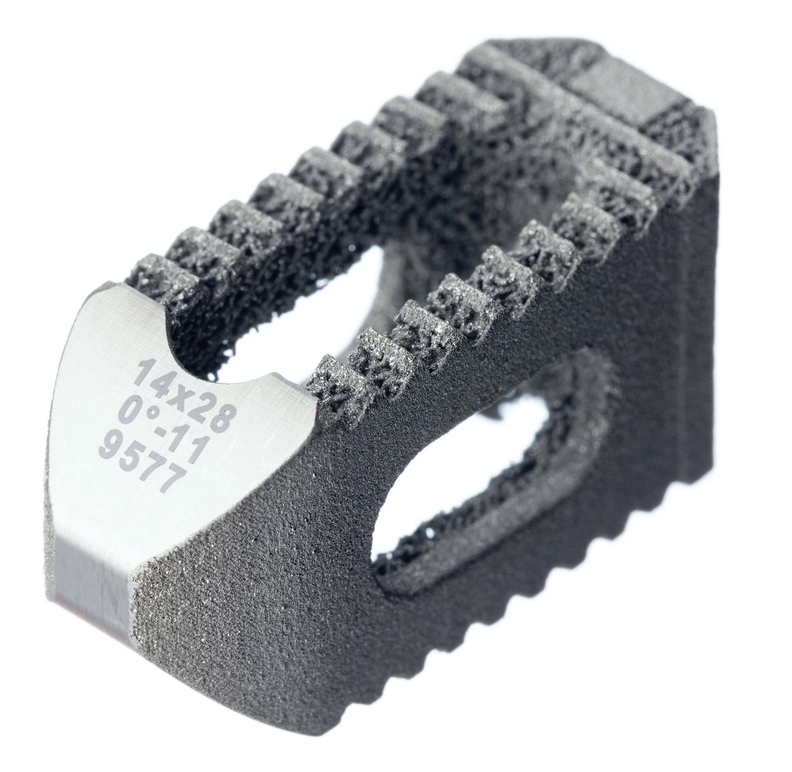 Stryker's Ireland-based additive manufacturing experts determined that instead of carving a device out of a block of titanium, they could 3-D print it using a laser beam that melts a powder of titanium alloy particles, building the lumbar cage from the base up, layer by layer. It's the spine division's first 3-D printed product, though the devicemaker has used 3-D printing in other divisions, including knees and craniomaxillofacial products (involving the jaws, face and skull). Stryker's 3-D printers build 700 to 800 layers into the spinal implant, creating a “cookie sheet” of multiple implants in each batch. Including post-processing, it takes roughly two days to create a batch of implants, of which Stryker offers 64 sizes. “From an engineering standpoint, this technique became popular just because of your design freedoms,” said John Mayor, vice president of marketing for Stryker Spine. Although Stryker's titanium process is expensive, it wastes less raw material. The excess powder can be re-used for the next batch. It also commands a premium in the marketplace and is boosting the company's profits. Mayor declined to disclose prices, but he said they will inevitably come down as the device becomes more popular, and Stryker uses the manufacturing process in more applications. When basic plastics are used to make models or patient-specific devices, 3-D printers are often significantly faster and cheaper than conventional manufacturing methods—sometimes allowing production for as little as 10% of the cost of conventional molds, said Michael Gaisford, director of medical industry marketing for Stratasys, an Eden Prairie, Minn.-based manufacturer of 3-D printers. For some products, such as patient-specific models created for surgical planning, there's no comparable cost. They simply weren't possible before. 3-D printing is advancing from “what-ifs” and tinkering stages to commercial use and mass production. Mass producing metal products with 3-D printing generally is more expensive than traditional manufacturing, said Matt Craine, chief operating officer and co-founder of Becoming 3D, a reseller of 3-D printing equipment that has worked with Stryker. But because many of those medical devices are shown to have better outcomes, insurers and providers are willing to pay more for them, Craine said. Stryker sees so much promise in additive manufacturing that it plans to build a second 3-D printing facility this year in Ireland as a part of $400 million to $450 million in capital expenditures the company expects to make this year. It will initially be reserved for innovations such as the lumbar cage and Stryker's cementless knee rather than replacing existing products. CEO Kevin Lobo said in a recent earnings call that the company has a “huge lineup of other divisions with ideas and prototypes” for the titanium printing process. The Food and Drug Administration has taken notice of additive manufacturing's advent among manufacturers, and shared its initial thoughts on its technical considerations in draft guidance issued May 12. The agency detailed what kind of pre-market information manufacturers will need to provide the FDA, guidelines for manufacturing processes and recommendations for testing, among other considerations. Mass producing devices in this way takes significant capital and scale and is still in its early stages for medical use. Much of the innovation in clinical 3-D printing is still happening on a case-by-case basis at America's top academic medical centers, but those institutions are edging closer to commercializing their ideas. At the University of Michigan Health System in Ann Arbor, Dr. Glen Green wondered whether 3-D printing could solve the problem of tracheobronchomalacia in infants, a condition in which the windpipe collapses because of abnormal development. There hasn't been a good solution for the problem, which can put babies in intensive-care units for months, struggling to exhale. Green, a pediatric otolaryngologist, teamed up with Scott Hollister, a professor of biomedical engineering at the university, to develop a biodegradable tracheal splint, customized through patient imaging. 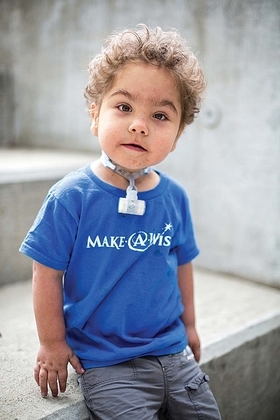 The device is sewn around the child's airway to push the trachea into a natural configuration and later dissolves. Five children have benefited from the splints, which were approved under emergency exemptions from the FDA, denoting that there was no alternative that would save the patient from imminent death. Studies at U-M have found that early treatment of the condition can prevent complications from conventional treatments such as tracheostomy, prolonged hospitalization, mechanical ventilation, food malabsorbtion and cardiac and respiratory arrest. The university plans to commercialize the product with a Belgian company called Materialise. Green said 3-D printing allows his team to personalize medical devices in ways they have never been able to do before, and without the need to cut into the patient before designing the device. U-M physicians are currently creating models and devices for a number of body parts, including ears, noses, jaws and cartilage constructs. “Within 24 to 48 hours, you can have a model or device that's specific to a patient,” Green said. Engineers and doctors 3-D printed a custom-made splint that was sewn into this child's airway to hold it open when he was 6 weeks old. It will gradually be absorbed into his body and dissolve over time. Some companies are even using 3-D printers to bioprint, meaning the “ink” of the printer actually contains human matter such as stem cells. This technology can be used to create research models for disease and drug researchers, or therapeutic tissue that could help treat disease. “The cell scaffold is critical all the way down to the microscopic level. (Bioprinting is) like moving into a really great condo that's the right space for you, as opposed to dumping you into some place that isn't your preference. The cells grow and thrive,” said Dr. Ray Golish, chief of spinal surgery at Jupiter Medical Center in Palm Beach, Fla.
Golish, chairman of the biomedical engineering committee at the American Academy of Orthopaedic Surgeons, has used 3-D printing to create guides for placing screws and hardware in the spine with better accuracy, based on patient scans. The guides also give him a model of the patient's anatomy that can be studied to better plan for surgery. The applications of 3-D-printing in healthcare aren't limited to devices. Aprecia, a privately owned specialty pharmaceutical company based in Langhorne, Pa., gained FDA approval in August to manufacture and market Spritam, a 3-D-printed anti-seizure drug and the first 3-D-printed pharmaceutical to be approved. Traditionally, drugs are made by compressing pharmaceutical ingredients into various molds, a process that manufacturers can complete quickly and cheaply. But it's more difficult to pack a significant amount of active pharmaceutical ingredients into fast-melt drugs like Spritam, which disperses in a patient's mouth or a glass of water. Physicians prefer fast-melt products to boost medication adherence among patients who have trouble swallowing pills, especially pills that are exceptionally large, said Aprecia CEO Don Wetherhold. Liquids, by contrast, tend to be less convenient to take and transport. Aprecia scientists were looking to create a dispersible fast-melt drug that could hold higher dosages of a medication but still disperse quickly, and found that 3-D printing could be a good way to tightly pack pharmaceutical ingredients into a tablet for oral suspension. Aprecia's 3-D printers deposit a liquid onto a sponge-like powder in a pre-programmed manner that creates the high-dosage tablets in 20 to 30 layers. Through the company's patented process, Wetherhold believes Aprecia will eventually be able to print different features into drugs by weaving multiple ingredients together, even releasing different ingredients in different phases. Wetherhold said the process, or a version of it, could one day allow pharmaceutical companies to create personalized drug tablets that include features and ingredient formulas of that are specific to patients and conditions.